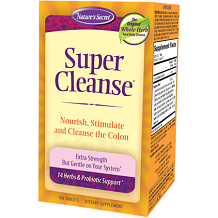 Read the following review about Nature’s Secret Super Cleanse. 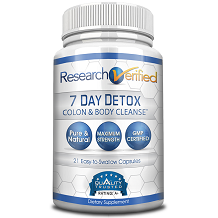 This product claims to promote deep internal cleansing of the colon. It claims that its specific ingredients are designed to stimulate, nourish and cleanse the lower intestinal tract in order to support the body’s natural detoxification process. With its help, it claims to help flush toxins out of the intestinal tract, while improving colon health and digestive function overall. Other ingredients include microcrystalline cellulose, stearic acid, gum arabic, croscarmellose sodium, silicon dioxide, magnesium stearate, sodium carboxymethyl cellulose, dextrin, dextrose, soy lecithin and sodium citrate. The product itself contains no dairy or soy. There are 100 tablets per bottle. One tablet is to be taken in the morning and one in the evening. An increase of 1 tablet should be taken every other day until 2-3 bowel movements are formed per day. Once your body has reached this, it is advised to continue with that particular amount for enhanced internal cleansing for up to 30 days. You are not to exceed 30 days of continual use of this product and a break of 30 or more days between use will help maintain regularity. This product is not intended for long-term use. As stated on the product itself, a doctor must be consulted before starting with these tablets particularly if you are using any sort of medication including diuretics, heart medications, and corticosteroids or suffer from any medical conditions. Do not use if you have an intestinal obstruction, hemorrhoids or other intestinal disorder. It is advised not to use this product in conjunction with any product that has laxative effects. This product is not meant to be used if you are trying to get pregnant, are pregnant or are nursing. It is advised not to exceed the recommended daily intake and it is not intended for use by people under the age of 18. Nature’s Secret Super Cleanse also advises that it is not to be used without breaks. One of their ingredients, Cascara Sagrada belongs to a family of plants containing compounds with laxative effects. Cascara Sagrada can also worsen diarrhea, loose stools or abdominal pain. This can lead to dehydration as well as electrolyte loss. If taken without breaks, this particular ingredient may interfere with diagnostic imaging procedures of the colon. This product contains a chemical that can cause birth to defects or other reproductive harm. The price of this particular product is well priced at $20.99 where you can purchase it online and shipping and handling is included – which is fantastic! Purchases over $50 will receive an automatic 10% off at checkout. Purchases over $100 will receive an automatic 15% off at checkout. Every order also comes with a ‘Wellness Kit’, which includes health information and over $60 in product coupons. There seems to be a secure PayPal option. There are typical warranties and guarantees found when buying this particular product on Amazon but sold at different prices. It is a worry that there is no guarantee stated on the actual product itself on its actual website as this often denotes inefficiency and loss of confidence from the manufacturer with the product. The product seems very translucent with both its ingredients and warnings which is great. We also find that the price is good in relation to other products similar to this. What really bothered us are the multitude of side effects including birth defects or the possibility of other reproductive harm. Unfortunately, as lovely as this product seems with its many ingredients and great price, we cannot recommend it.